VOTE FOR US TO WIN A SHARE OF £10,000! 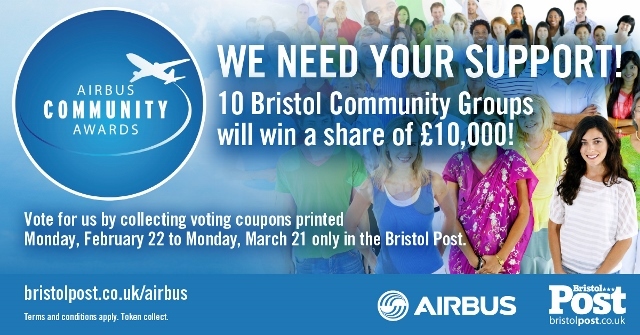 We have been chosen to be in with a chance of winning a share of £10,000 in the Bristol Post and Airbus Community Awards. Cash prizes are given to the top 10 groups with the most votes so we need your help! Voting Coupons will be printed in the Bristol Post from Monday 22nd February until Monday 21st March. Please pick up a copy of the paper and fill in the coupon with our details. You can send the coupon direct to the paper (see the Bristol Post for details), or you can send them to the office or hand them in to your club leader. Voting closes at midday on Wednesday 23rd March so please send your votes off as soon as you can. Help us spread the word and collect as many votes as possible! Previous PostSuper Saturday Club Trip to CrealyNext PostThank You for Voting!